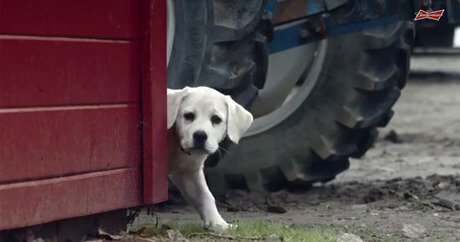 One of Super Bowl XLIX Budweiser offerings, “Lost Dog,” is already a big hit. This year, a 30-second commercial during Super Bowl XLIX will cost advertisers approximately $4.5 million. While there will be some standard flashy beer and luxury car spots during the game, we here at DogTime and CatTime are hoping to see some furry faces between plays. Here are some of our favorite commercials from Super Bowls past — and future. Super Bowl XXXIV (2000): One way to make sure your Super Bowl commercial is noticed is to make sure there are thousands of cats meowing and running around with cowboys. EDS, an HP company, uses the expression of “herding cats,” in a quite literal way, and the result is either hysterical or horrifying. Super Bowl XLIX (2015): This ad hasn’t officially aired yet, but it is easily one of the best Super Bowl commercials featuring cats, or possibly of all time. Friskies teamed up with Buzzfeed, the masters of cat lists and creators of the “Dear Kitten” series, and created this 3:39 magnum opus. A one-minute version will only be airing in three local markets — Los Gatos, Calif.; Kitty Hawk, N.C.; and Pawnee City, Neb. — so get your fix here. Super Bowl XLVI (2012): In 2011, everyone fawned over the VW commercial featuring a child Darth Vader. In 2012, Volkswagen struck back with this spot. This commercial may hit too close to home for those who put on a little holiday weight, as this dog puts most people’s work out regimens to shame. Super Bowl XLIII (2009): This is a sentiment we can get behind. This ad doesn’t just feature dogs — it features a rhino, an ostrich, and some type of boar as exotic pets. Adopting your dog is an easy decision to make after watching this cute, clever ad by Pedigree. Super Bowl XLVIII (2014): Last year, the Internet exploded even before the big game when this spot was released online. Puppy + Clydesdale = best way to sell beer. Ever. The company has released teasers and a full ad for this year’s game called “Lost Dog,” and there’s no way it won’t be as popular as 2014’s offering.